I got a call from Candyman about a month ago. 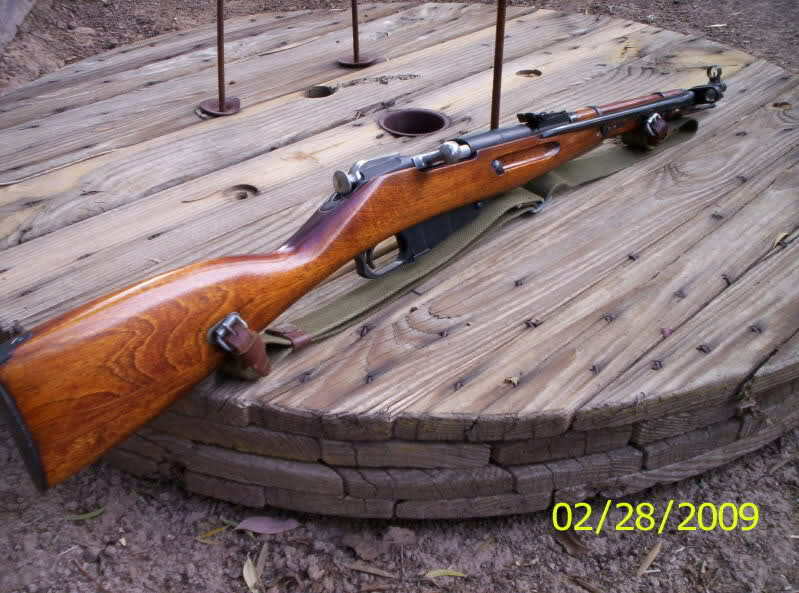 He had an Mosin M44 stock that had the toe cracked off it, the toe wasn't even with the stock, so a new one would have to be made from scratch. I'd never done this type of repair before, but I needed something to do as I was bored out of my skull, and I had the basic idea of how to go about the repair. Now bear with me folks, my instructions on how to do the repair aren't that great, and taking pictures all along this month long project was annoying at times. Candyman is much better at the whole tutorial posting thing than I am. But atleast you all can see what I was able to do with the stock. Here's the stock at Lee's house before he shipped it to me. The first thing I did was start on the area of the toe that would need to be filed perfectly flat. As it was very uneven. 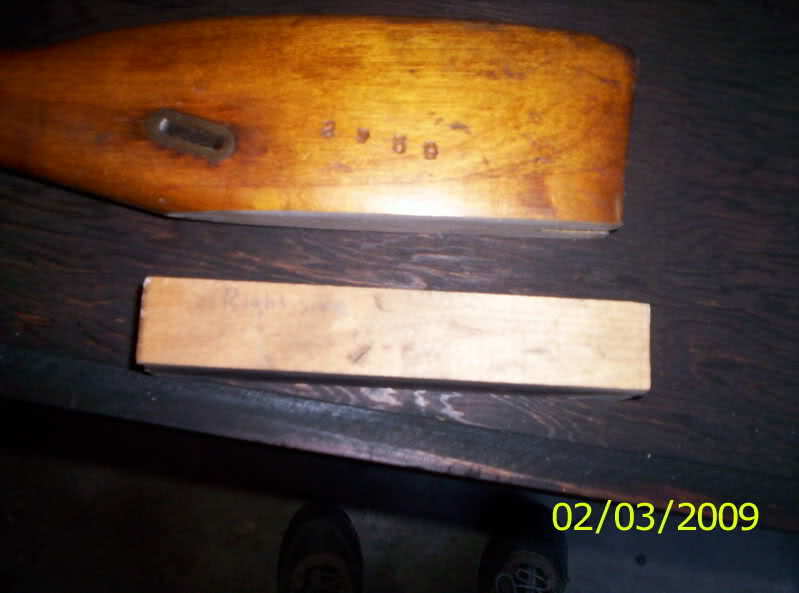 This is the piece of birchwood that would become the toe. 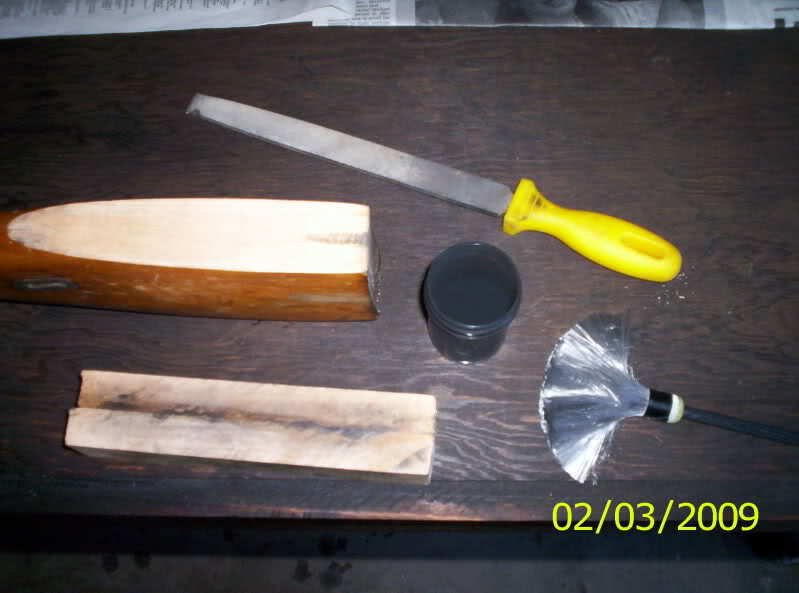 Here are the tools I used to get the toe of the stock flat. A flat file is really all that's needed. But I had some fingerprinting dust laying around that my aunt had given me, she was a CSI several years ago and used to get alot of the stuff. 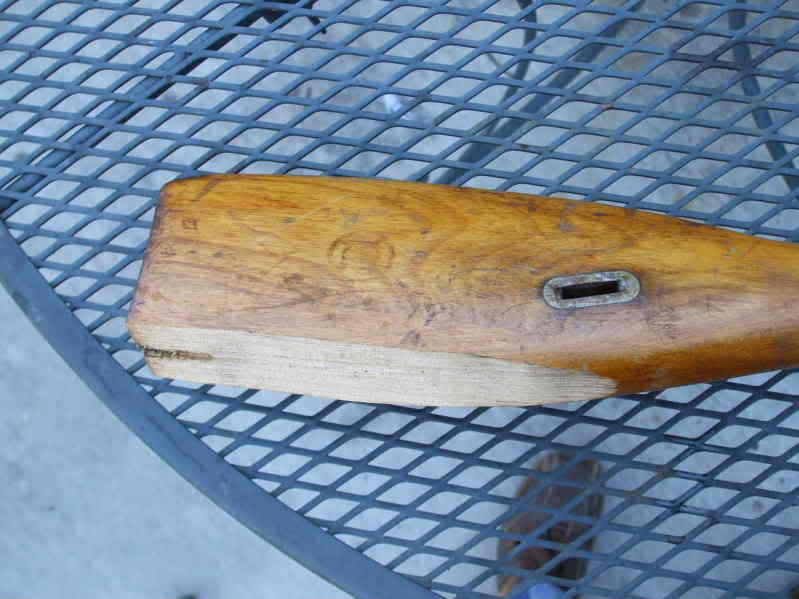 What I did was dust the bottom of the slice of birchwood, then placed it on the toe of the stock, and pressing down I rubbed it back and forth across the toe of the stock. The black dust that's on the birch will rub onto the stock, showing where the high spots are. I then either filed the black area's down until the soot was gone, or used my sandpaper block if I needed more precision and less wood to be taken away than with a file. 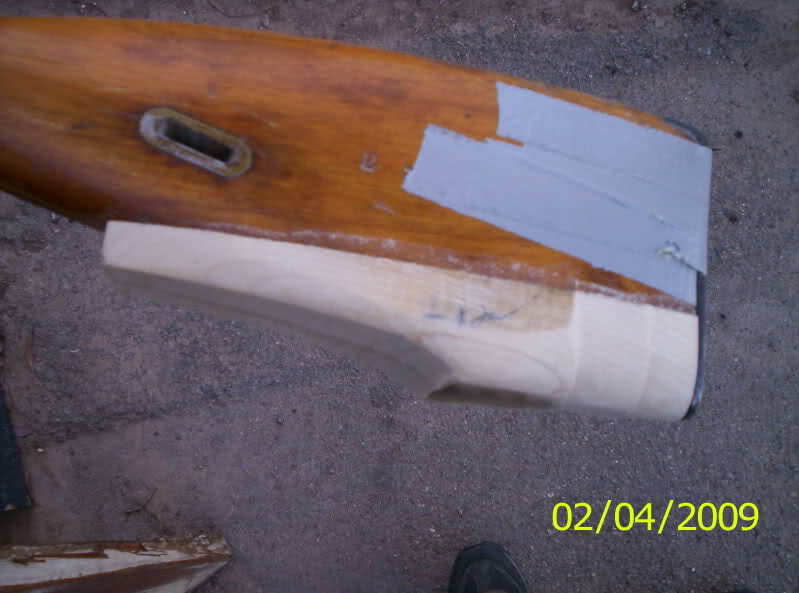 After this you just redust the area, rub it on the stock, and repeat the filing or sanding process until the black is rubbing onto the stock very evenly. 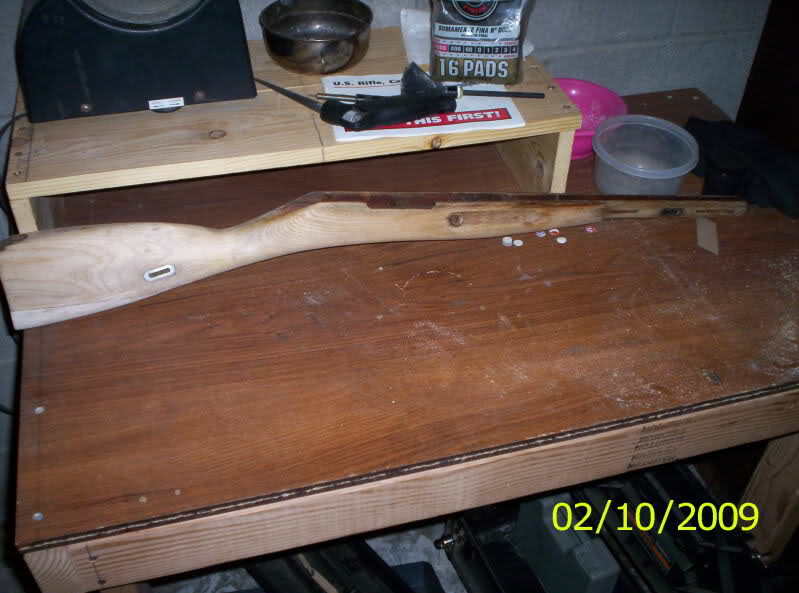 When the stock was even enough to satisfy me, I then proceeded to start attaching the birchwood to the stock. 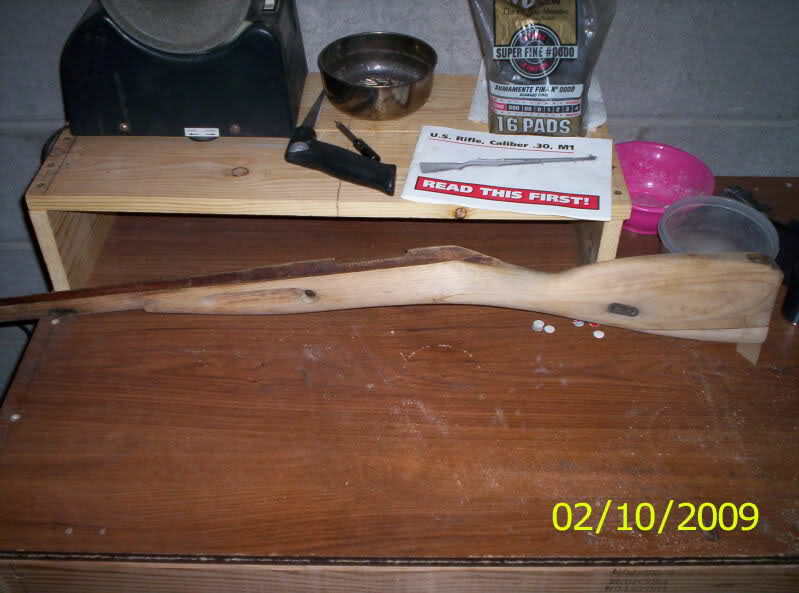 The first thing I did was drill some shallow holes in the birchwood, and the stock. This will create a stronger bond, sort of a mechanical lock with the epoxy. It's not necessary though. I mixed up enough Devcon 2 ton clear epoxy weld to completely cover the bottom of the stock, and the bottom of the birchwood piece, as well as fill in the holes. 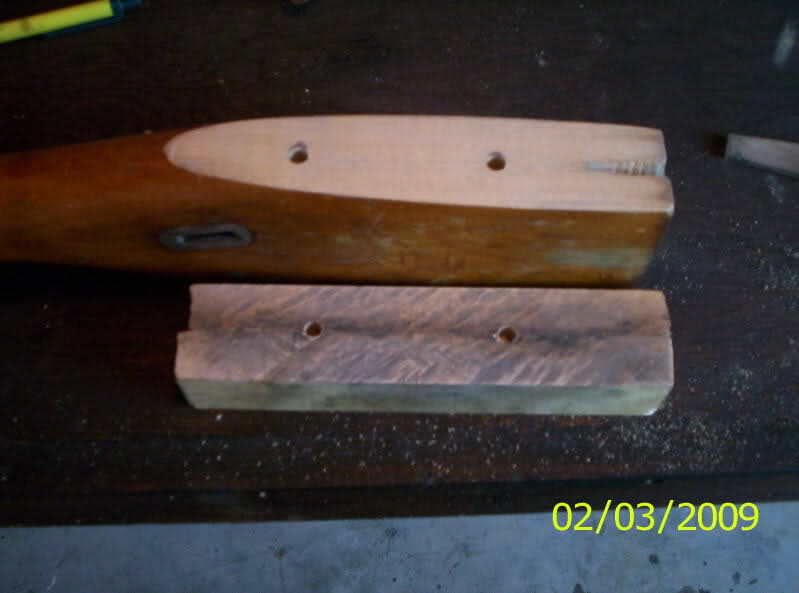 I then clamped it onto the stock with another piece of wood ontop to prevent the clamp from gouging the wood. I put some paste wax along the edges of the stock near the seam of the repair, incase any epoxy seeped out, that way if any does seep out it will chip off when dry. Be sure not to get any wax in your crack though. 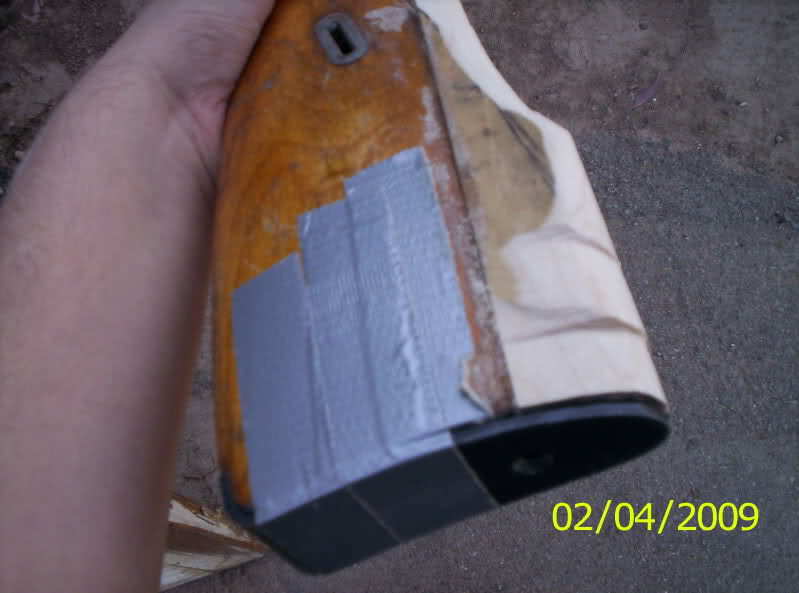 With the buttplate on just to show how much wood I had to work with. Using a bigger piece of birch would have helped. I waited 48 hours before starting the slow process of shaping. This is the hardest part of putting on a toe from scratch. One slip up, and you have to restart. So take it slow. Each person will find what technique works for them as far as how to shape it. I like to start with the sides, getting the curvature of the sides of the stock correct, then work on the very top (bottom really) of the toe, getting the geometry of the bottom of the stock correct. Whatever works best for you, the key is PATIENCE!!! 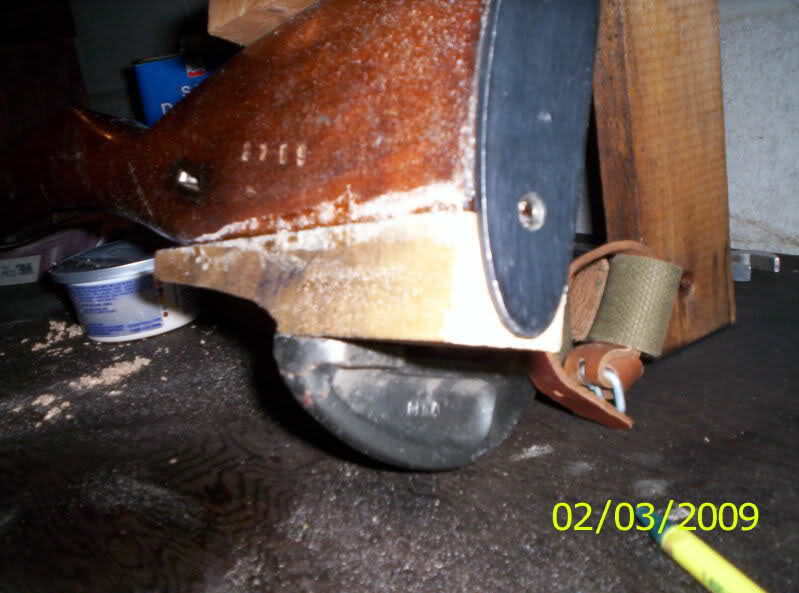 You will want to keep the buttplate taped on while shaping, to prevent removing too much wood from the bottom of your toe, buttplate overhang is unsightly, trust me. And after 3 or 4 days of filing. This is what I came to. Almost done, still a bit to fat though. 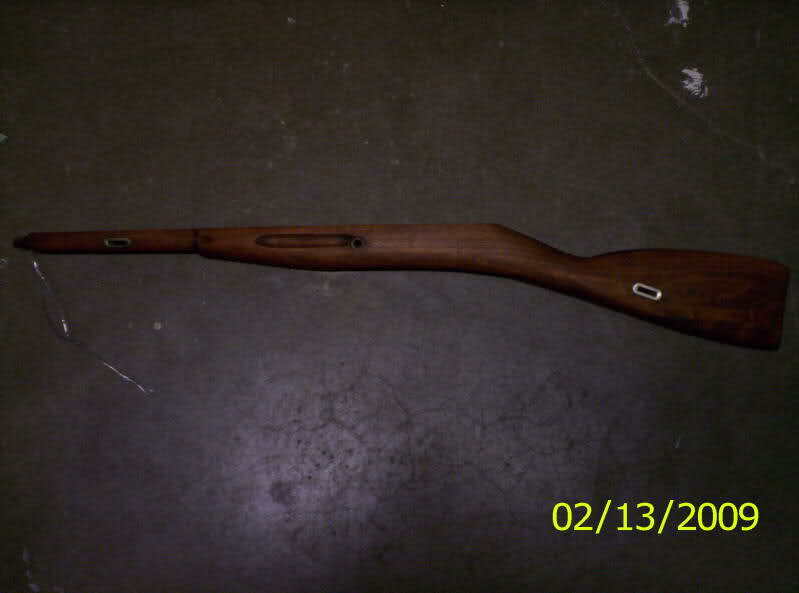 What helps is every mosin stock is differently shaped, so it's not like I'm following a blueprint here. This is the stock after 2 strippings with StripX. Which is covered in many other posts by Candyman and 1 post by me. What the rear looks like. Yes, I had to epoxy two pieces of birch to make one large piece big enough for this toe repair. As I didn't have access to a larger chunk of birch. 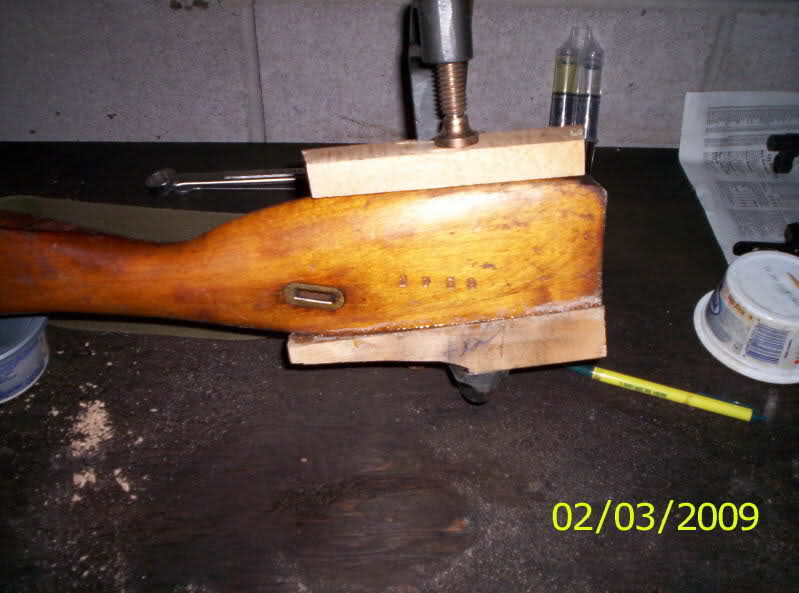 When doing this, you can epoxy your toe onto the stock seam side down, so it doesn't show, and still looks like a 1 piece toe from the sides of the rifle. 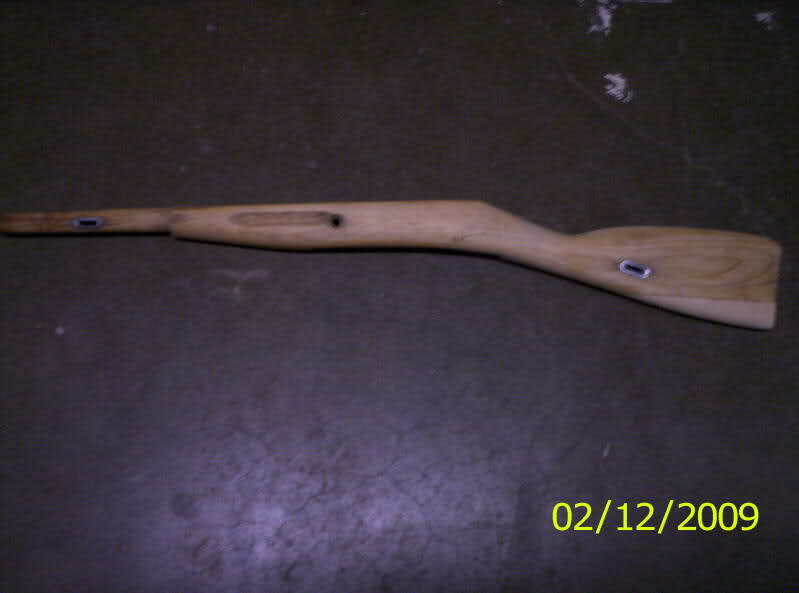 Here's the stock after a good sanding with 100 grit. Try to avoid touching the fingergrooves of the stock at all. To prevent from rounding the edges. This will also make a stock look pretty ugly. 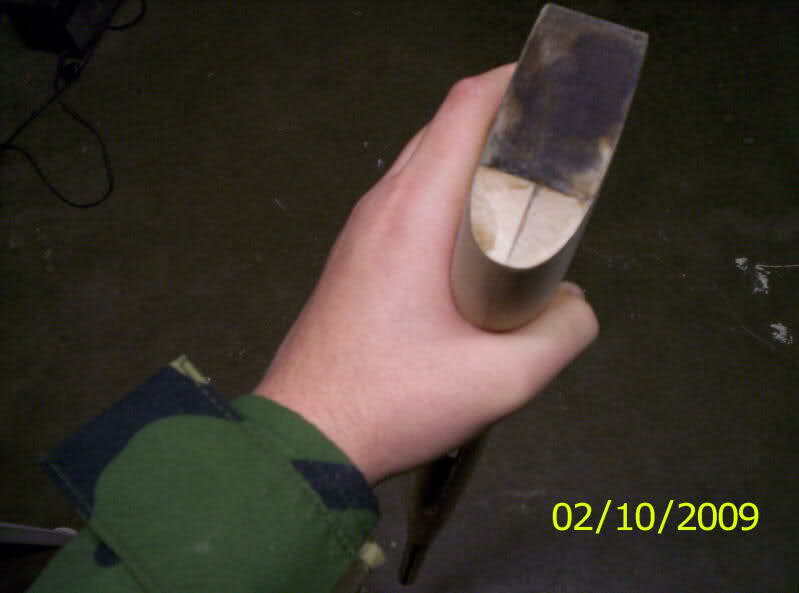 I used an electric hand orbital sander. I only do this when i'm using a relatively low grit paper, to prevent from turning my stock into a toothpick. This will also create sanding swirls in the stock, so you'll have to sand those out manually with some finer grit paper and a sanding block. Always use a block. 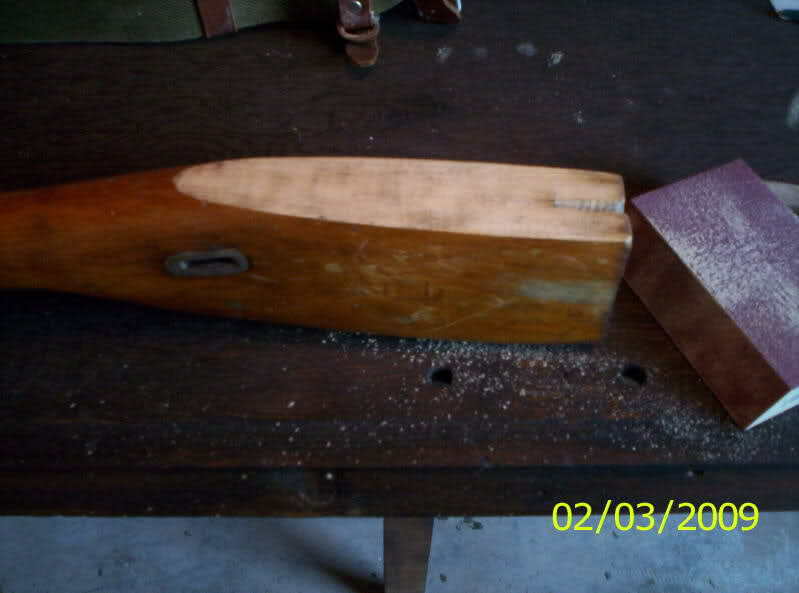 Usually I advise against sanding, but in this case it's a stock with zero collectability value, so I wasn't worried about it. 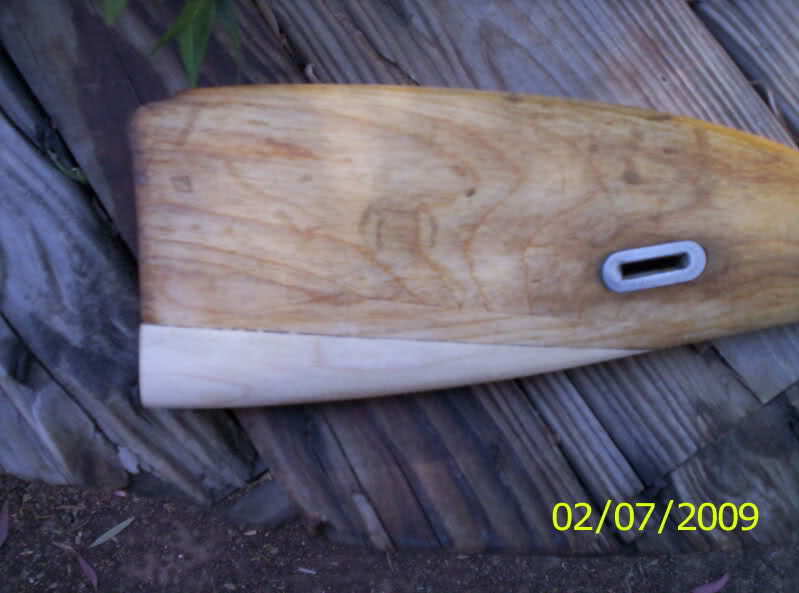 I also made sure to keep away from the edges to prevent rounding, and buttplate overhang. 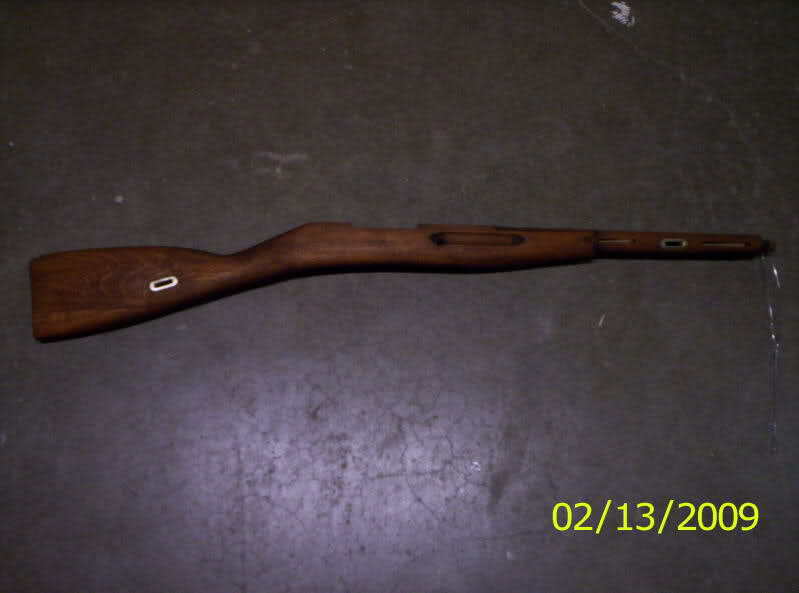 I used chestnut ridge alcohol based stain on the stock. It's dark walnut with a red tint. Use gloves when using it, don't be too stingy with it, and always use a painting sponge or something similar to apply it. Paper towels will soak it up, and you'll end up using wasting more stain to get the stock to a color you could get with a lot less stain using a sponge. Alcohol does raise the grain, so you will want to steel wool it vigorously with 0000 steel wool. I do it just enough to smooth the whiskers out, if it lightens up too much you can apply a second coat of stain, it will not raise the grain nearly as much and will darken it a little more than the first coat. Let the stain cure for about an hour, or 30 minutes in warmer temps. You can see where the grain on the left of the new toe is "wilder" than the right side. It also came out a bit lighter, this area of the wood is denser, and doesn't accept stain as well as other less dense parts of the wood. And here is the end result! After a few weeks of applying my Tru Oil finish, and letting it cure for awhile. 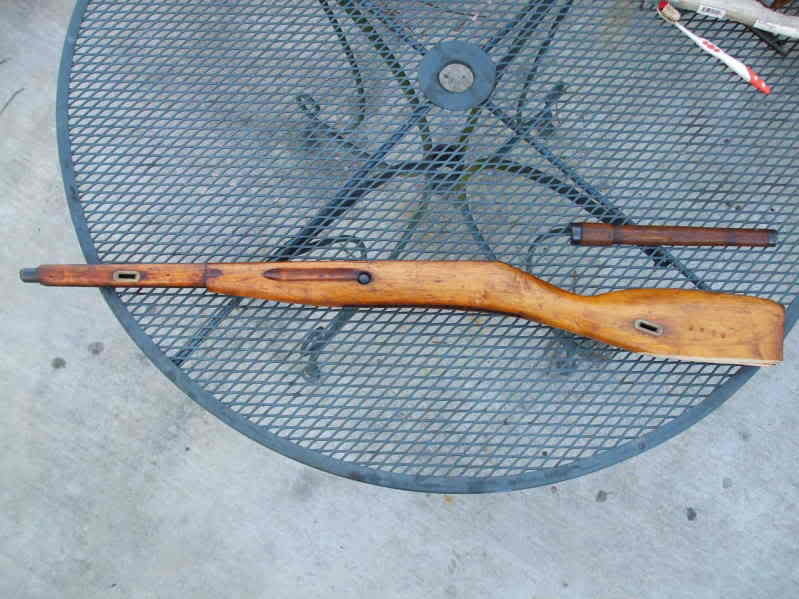 I have a new stock on my M44 that I like alot better than my old one. 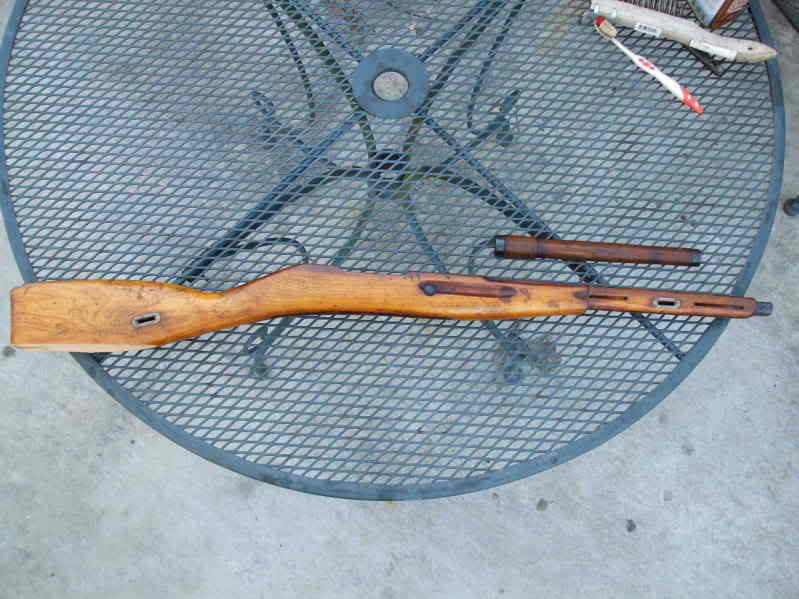 The old one I refinished back in my "bubba days" when I used oven cleaners, over sanded everything, and used monkey glue on cracks of gunstocks. I thought it was so smart then too. In less than a year I went from bubba to being able to install a new toe from complete scratch on an old stock, and give it a beautiful smooth as glass finish to boot. I'll take some more pictures tomorrow when I get some light.